Good credit is a key piece of your financial picture. If you want to borrow money to buy a car or a home, or just open a credit card without getting pinched by a high APR, you need a solid credit rating. But what if your credit is bad and you want to fix your credit fast? Take a look at what you should–and shouldn’t–do to start building a better score today. It’s a lot harder to fix your credit score when you don’t know what’s holding you back. First things first, get a copy of your credit report and score. You can get your free credit score instantly from Credit Sesame, along with a breakdown of what factors are helping your score and which ones aren’t doing you any favors. 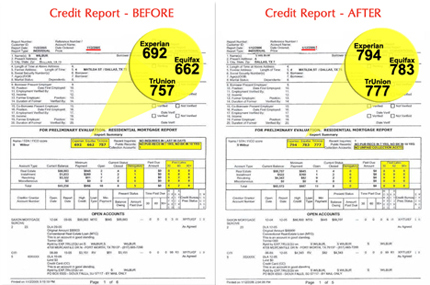 Having a mistake on your credit report can spell disaster for your score. As you check your reports, look for any errors or inaccuracies. If you spot one, don’t waste any time in disputing it with the credit bureau that’s reporting it. They’re legally required to investigate the dispute and remove or correct any errors once they’ve been verified. That could add valuable points back to your score. To help fix your credit fast, don’t over utilize your credit cards. One of the biggest things affecting your credit score is your credit utilization. This is how much of your available credit you’re using. Having several credit cards that are close to their limit or maxed out can hurt your score in a big way. Requesting a credit limit increase can improve your utilization ratio, helping your score to go up in as little as a month. This is pretty obvious but resist the temptation to use some of your new credit limit if you’re approved for an increase. If anything, you should be focusing on improving your score even more by paying down your existing balances. Paying off your debts is the best and quickest way to fix your credit fast. If you don’t have any luck with requesting a credit limit increase, you could still improve your utilization ratio by opening a new credit card account. Just remember to do your research and pick the card that best fits your spending style and needs. Each time you apply for new account it knocks a few points off your score so you don’t want to go crazy with credit applications. That said, getting another credit account can help fix your credit fast. Keeping old accounts open will help build your credit score. The average age of your credit accounts is another piece of the credit score puzzle. If you’ve got older accounts open that you’re not using, don’t rush to close them down, since that could hurt your score. Instead, consider making one small purchase every few months, then paying it off to keep your card active. Another way to fix your credit fast is to track your progress. Credit scores aren’t set in stone and they can change quickly. Tracking your score over time is a good way to see how your efforts are paying off. For example, if you signed up to get your free credit score from Credit Sesame, you can get your updated score each month, along with regular credit monitoring. We like Credit Sesame here at thousandaire.com – their interface is smarter than other free options like annualcreditreport.com. For some reason there is this idea going around that you can pay a hacker to get into the credit agency’s computers and change your scores. Equifax’s issues not withstanding, paying a hacker to solve your problems is a pipe dream. If you do manage to find one, the chances of getting ripped off are high. Also, in the unlikely event you found a hacker who did change your scores, this kind of quick fix will rob you of the opportunity to develop good money habits. Photo credit: Trinty Credit Services.